Perfect for the Fashion obsessed! THE BRIEF: Design and make a summer dress. INSPIRATION: A country of their choice. Teaching children how to take inspiration from something and turning their vision into a reality. 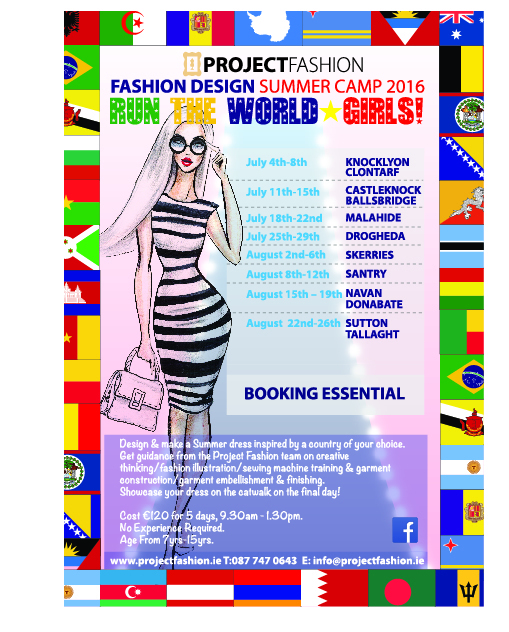 Project Fashion Summer Camp is a week-long camp, running from Monday to Friday from 9.30am-1.30pm every week of the Summer in different locations. The camp focuses on the process of Fashion Design, from creative thinking, fashion illustration, sewing machine training and garment construction. They can finalise their project using appliqués and embellishments. And then for the grand finale! All the students will be able to proudly showcase their work on the final day in front of their parents and guests in a thrilling fashion show! Cost: €120. 2nd siblings discount. Fabric not included. Students must bring in fabric for the first day of camp which relates to the country of their choice. They will need 2 metres of fabric with at least 112 cm’s in width. They will receive discount in the following fabric shops, once they mention they are Project Fashion students. Home focus, Northside & Blanchardstown, The Craft Hub, Donabate & Murphy Sheehy, Dublin 2. We will be arranging discount with other stores, details coming soon. All other materials, embellishments, appliques and tools will be supplied. WANT TO ASK A QUESTION OR BOOK A PLACE ?